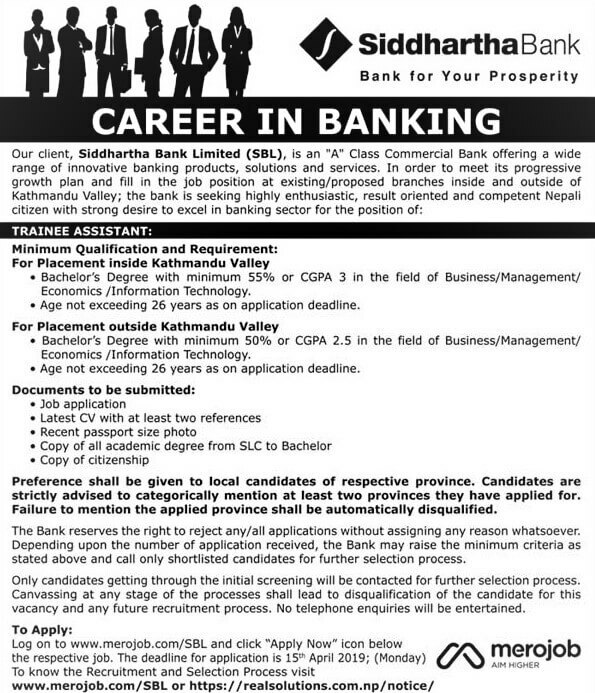 Home / Banking jobs / Vacancy / Siddhartha Bank Limited Vacancy Notice for Trainee Assistant. Siddhartha Bank Limited Vacancy Notice for Trainee Assistant. Bachelor’s Degree with minimum 55% or CGPA 3 in the field of Business/ Management/ Economics/ Information Technology. Age not exceeding 26 years as on application deadline. Bachelor’s Degree with minimum 50% or CGPA 2.5 in the field of Business/ Management/ Economics/ Information Technology. Log on to www.merojob.com/SBL and click "Apply Now" icon below the respective job. The deadline for application is 15' April 2019; (Monday).